There are four ventricles of the brain: two lateral ventricles, a third ventricle and a fourth ventricle. The 2 lateral ventricles, 1 in every cerebral hemisphere, create the largest component of the ventricular system. They inhabit a large part of the cerebral hemisphere and are divided from every other by the septum pellucidum, going between the corpus callosum and the fornix. The 3rd ventricle is a narrow slit-like cavity of the diencephalon. 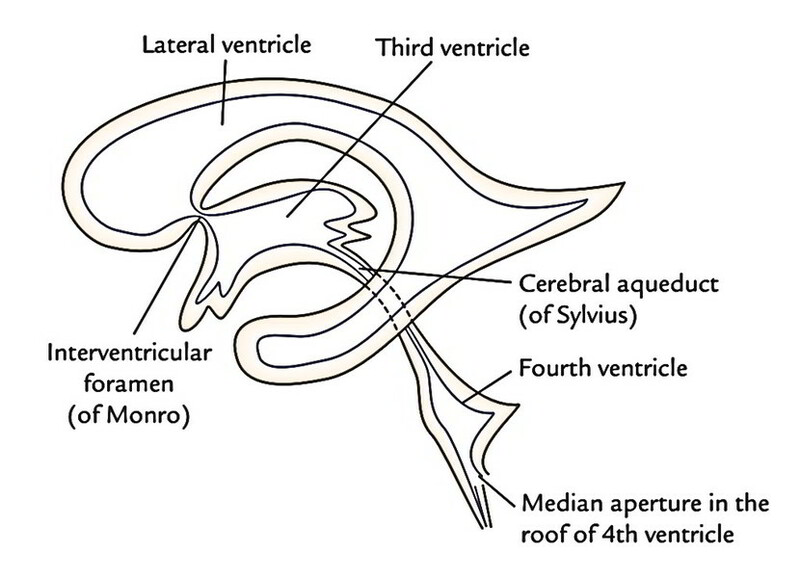 The 2 lateral ventricles are linked with the 3rd ventricle through the interventricular foramina (of Monro). The 3rd ventricle interacts via the cerebral aqueduct of midbrain with the 4th ventricle, a cavity inside the hindbrain. The 4th ventricle, in turn, is constant with the central canal of the spinal cord. The central canal has a small dilatation at its inferior end, the terminal ventricle. The cerebrospinal fluid (CSF) is composed in the ventricles by the choroid plexuses and goes through apertures in the roof of 4th ventricle into the subarachnoid space around the brain and spinal cord.